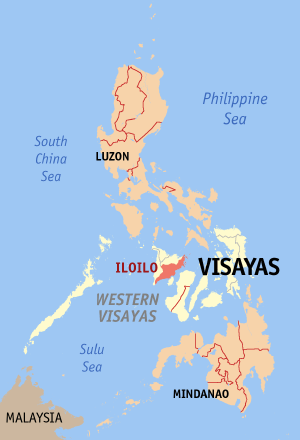 ILOILO CITY, Philippines – The entire province of Iloilo was placed under state of calamity Saturday afternoon, November 9. Meanwhile, the town of Sara, remains isolated as of Saturday afternoon after the flood damaged roads to the area. A number of towns in the 5th district – including Carles, Ajuy, Barotac Viejo, Concepcion, Batad, San Dionisio, San Rafael, and Balasan – also suffered the brunt of Yolanda. November 5, 2013, in the town of Ajuy, Iloilo, Mayor Juan Alvarez had joined local police officers in their rounds. “We advised our people to prepare as best they could for Yolanda,” Mayor Juan says. Many locals had already evacuated to assigned centers. Relief packs had been received at different schools, and families had already received food packs. “… Yolanda struck. I was in my office. First, I was confident that the building would be resilient: but since the windows were shaking so hard, and trying to break, I hid myself here, away from the windows. All I could hear were loud bangs as the window glass was destroyed. Mayor Palabrica of Bingawan remembers shared that immediately after seeing the widespread devastation, he initially felt depressed and frustrated. On the long road to recovery, where would they begin? Before Super Typhoon struck Bingawan in 2013, they also experienced a strong typhoon – typhoon Quinta – in 2012. “Maybe it is really a result of climate change. It was two years consecutive for us, Quinta and Yolanda,” Mayor Matt P. Palabrica suggested. “Yolanda was the worst disaster in the history of our community,” Ma. Theresa S. Carsola, a teacher at the local elementary school, remembers. e events, was used as a temporary evacuation center. Before Super Typhoon Yolanda devastated the municipal hall i n Dumangas, Iloilo, water leaks has been a recurring problem on rainy days. “For the longest time, it is really our problem there. Our guests would usually see the leaks or the pales catching the leaks or much worst employees mopping the floor,” explains municipal employee Angela D. Docdolu. “It is really embarrassing, especially when there’s a meeting.” The employees often joked that it was like sa ilalom ng saging (under the banana tree): though covered from the rain, you’ll still get a little wet. This sadness, felt across much of this affected community, was also experienced by Juvy Y. Espiga, a rice vendor in the Estancia public market. She didn’t expect that Yolanda would bring about significant damage to their market place. Long before the arrival of super typhoon Yolanda, in Janiuay, Iloilo, disaster risk prevention measures had long since served as a top priority. “Since 2010, our LGU have been practicing and enforcing preventive measures, including evacuations, long before the arrival of Yolanda,” Ricardo S. Minurtio shared. To ensure that these preventative measures are effective during ‘real time’ disasters, these community-based activities include a range of sectors within the municipality: schools, government officials, local groups, and the like. “You have to make the people aware, and you have to train them,” Mayor Frankie H. Locsin believes. Located along the northeastern coastline of Iloilo, the municipality of San Dionisio was among those worst affected by Super Typhoon Yolanda. While locals were advised to evacuate prior to the typhoon’s arrival, forced evacuation measures proved a challenge in a municipality more used to the impacts of ‘regular’ typhoons. “Many just assumed it would be a normal storm,” Carlos says. While the townsfolk of San Rafael, Iloilo, were advised to expect Super Typhoon Yolanda, for many, it proved an experience far beyond expectations.